The Women’s Union of Russia hosted a very successful General Assembly of the ECICW from 18 to 20 May at the Arbat Hotel in the heart of the Russian capital, Moscow. The participants who arrived a day earlier spent the first day together on the hop on and off at the key locations and explored Moscow. 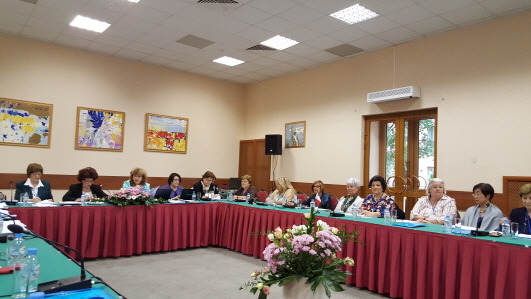 On the 19th May, Women’s Union of Russia organised a seminar with the title “Transforming society through political and economic empowerment of women” with the participation of representatives from Europe, Asia, Australia and New Zealand. Ekaterina Lakhova, Chair of the Women’s Union of Russia, made the opening speech. The presentations of the speakers from WUR, which was established 25 years ago, were very informative as they informed the audience about a variety of topics regarding women issues in several remote regions, such as Vladimir, Voronezh, Karadino-Balkar, Altay, Amur, Kursk, Nenetsky, etc. in the Russian Federation. It was stressed that WUR attaches much importance to securing and strengthening man’s and woman’s shared responsibility as parents to overcome social problems as they consider solid family would be necessary for a stable country. In Altay, WUR pays much attention to the indigenous population and is engaged in the protection of minorities and nomadic people in rural communities, giving priority to the improvement of the health care. Bringing nomads to the hospitals in the cities is impossible as tundra is one thousand km. away, air conditions are unfavorable, there is a lack of railways and roads making the air transportation necessary: in spite of its high cost, for indigenous minority pregnant women air transportation is free. We were also informed that the family children get 600 rubles and for children teachers special houses have been built and they are free. In the region of Kemerovo, the Council concentrates its work on the protection of pregnant women who should not be employed in heavy works in metallurgical plants. In Nenetsky WUR protects and empowers the women in indigenous and minority population living in hard conditions, trying to help them maintain their cultural identity, their political rights, their language and traditional life. During the coffee breaks the ICW delegates took the opportunity to meet and network with Russian sisters. After the talks President of WUR, Ekaterina Lakhova, presented plaques to the Presidents of ICW Jungsook Kim and of ECICW Cosima Schenk. In the evening of the same day the guests were invited to the Stanislavsky Ballet and Opera Theatre where they watched a wonderful performance of Giuseppe Verdi’s “Aida” opera, a unique experience. On the next day ECICW General Assembly was held with the participation of representatives from its affliated NC’s. After welcoming the distinguished guests and delegates, ECICW President Cosima Schenk talked about ICW’s mission to improve the status of women and well-being of society reminding its objectives to promote peace in the world and equal rights. The discussions on the reports of the NC’s, followed by those brief ones of European Women’s Lobby, Council of Europe and Fundamental Rights Agency, comprised most of the schedule and enabled the delegates exchange experiences, initiatives and ideas. ECICW President Cosima Schenk, in her speech, stressed the ICW’s strong conviction in democracy and equal rights for all. The ICW President Jungsook Kim in addressing the audience said that the ICW has been at the center of the global movement to bring equality and development to women for the last 128 years. She evoked the triennial themes of the ICW and said that the society can be transformed through empowerment of women. During the free time the guests took advantage of being close to Moscow's pedestrianised Arbat Street, which existed since the 15th century, where they could buy some souvenirs and local handcafts enjoying every moment spent in Moscow. On Saturday the 21st May, a breathtaking sightseeing tour was organized and the delegates enjoyed the scenic panoramic view of Moscow. The bus tour started at Moscow’s renowned Red Square where we had the opportunity to see the 16th Century St. Basil's Cathedral, one of the most famous pieces of architecture in the world. We traveled over Bolshoy Moskvoretsky Bridge, which spans the Moscow River and connects the Red Square and Bolshaya Ordynka Street of Zamoskvorechye. There was the Udarnik Movie Theater, the only cinema in Russia with a telescopic opening roof. We admired the world famous Kremlin, the historic complex at the heart of Moscow which serves as the official residence of the President of the Russian Federation and includes palaces, cathedrals and the Kremlin Wall with its towers. We also admired the golden-domed cathedrals and magnificent palaces. That evening Women’s Union of Russia hosted the Gala-dinner at Chechov Restaurant which was an excellent choice.A friendly atmosphere was created when the President of Women’s Union of Russia, Ekaterina Lakhova, presented beautiful swalves to ICW President Jungsook Kim and ECICW President Cosima Schenk. The food was delicious and presented with courteous service and good wine. The good lighting in the restaurant enabled us to see all of us and the guests had the opportunity to network and strengthen the friendship during the dinner. The whole was a great success. The Women’s Union of Russia had prepared a fascinating program for us and introduced the Russian culture, arts, cuisine and historical sites impressively. The delegates, all impressed with the cultural heritage of Russia, returned back home with the intention of rereading some of the masterpieces of the Russian literature represented by Pushkin, Gogol, Tolstoy, Chekhov, Dostoevsky, etc. ICW Board stayed in Moscow for other two days for the Board meeting. This gave them the opportunity to enjoy Moscow more and explore new locations such as Cafe Pushkin, one of Moscow’s legends. While eating we admired the baroque details, the stucco-work around the walls and ceilings. 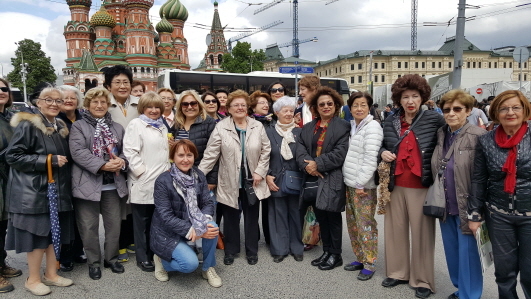 On the 24th of May a group of participants together with ICW President Dr. Jungsook Kim visited S. Petersburg, Russia's second-largest city after Moscow and its cultural capital. The city situated on the Neva River, was the imperial capital of Russia. We were informed that it is the northernmost city in the world with a population of over one million. The Hermitage, one of the largest art museums in the world was the last stop of our unforgettable Russian experience. With our heartfelt congratulations to our host Women’s Union of Russia, the organizing team of the programme and ECICW Secretary General Joelle Letsch.